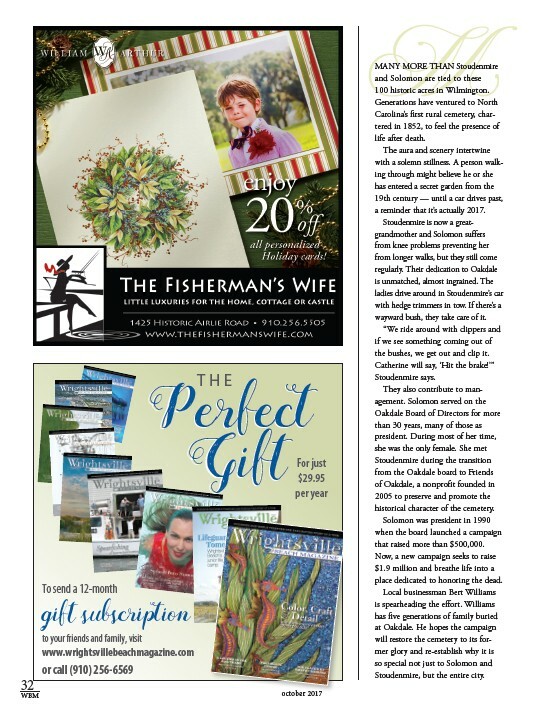 32 WBM october 2017 M To send a 12-month gift subscription to your friends and family, visit www.wrightsvillebeachmagazine.com or call (910) 256-6569 For just $29.95 per year t h e GGiifftt PPeerrffeecctt MANY MORE THAN Stoudenmire and Solomon are tied to these 100 historic acres in Wilmington. Generations have ventured to North Carolina’s first rural cemetery, char-tered in 1852, to feel the presence of life after death. The aura and scenery intertwine with a solemn stillness. A person walk-ing through might believe he or she has entered a secret garden from the 19th century — until a car drives past, a reminder that it’s actually 2017. Stoudenmire is now a great-grandmother and Solomon suffers from knee problems preventing her from longer walks, but they still come regularly. Their dedication to Oakdale is unmatched, almost ingrained. The ladies drive around in Stoudenmire’s car with hedge trimmers in tow. If there’s a wayward bush, they take care of it. “We ride around with clippers and if we see something coming out of the bushes, we get out and clip it. Catherine will say, ‘Hit the brake!’” Stoudenmire says. They also contribute to man-agement. Solomon served on the Oakdale Board of Directors for more than 30 years, many of those as president. During most of her time, she was the only female. She met Stoudenmire during the transition from the Oakdale board to Friends of Oakdale, a nonprofit founded in 2005 to preserve and promote the historical character of the cemetery. Solomon was president in 1990 when the board launched a campaign that raised more than $500,000. Now, a new campaign seeks to raise $1.9 million and breathe life into a place dedicated to honoring the dead. Local businessman Bert Williams is spearheading the effort. Williams has five generations of family buried at Oakdale. He hopes the campaign will restore the cemetery to its for-mer glory and re-establish why it is so special not just to Solomon and Stoudenmire, but the entire city.